The dramatic July 22 attacks in Norway that resulted in the deaths of at least 68 people inspired a vibrant conversation in the blogosphere last week. While sympathy for the victims was significant, more time was devoted to conversations about the killer, Anders Behring Breivik, according to an analysis of social media conducted by the Pew Research Center’s Project for Excellence in Journalism. In the six days following the attacks (July 22-27), the largest component of the conversation on blogs (38%) involved passing along breaking news and facts. Bloggers passed along tidbits of information in the hours that followed the two attacks and then continued to share information about the death toll, Breivik’s history and the developments in his prosecution. But fully 20% of the conversation focused on the motives and ideology of Breivik himself, a 32-year-old Norwegian who admitted he committed the murders in an attempt to “save” Norway and Western Europe from a Muslim takeover. The most common view about him at 15% of the total conversation was that he was a right-wing extremist. As more details about the shooter emerged, including the text of his 1,500 page manifesto, bloggers attached right-wing extremism to his motivations. A number of bloggers also tied his views to those of conservative political parties in Europe and the United States. A less common assessment of Breivik’s motives, at 5%, fought back against that classification. These bloggers argued he was not a true Christian or conservative and instead was a follower of another ideology such as socialism. Sympathy for the victims accounted for 16% of the conversation, as bloggers commiserated with those harmed in the attacks and for the country as a whole. Slightly less conversation, 7%, connected the attacks and Islamic terrorism, in some cases defending the early assumption in the media that Islamic terrorists were behind it. These are the results of a special edition of the New Media Index from the Pew Research Center’s Project for Excellence in Journalism, utilizing computer technology from Crimson Hexagon. 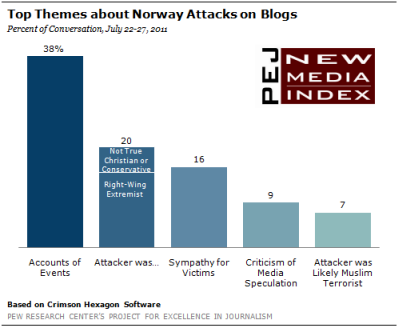 Based on almost 52,000 blog posts, this report goes beyond the normal methodology of PEJ’s index of new media to look at the specific themes and tone of conversation on blogs related to the Norway attacks. Minutes after the bomb went off in Oslo, bloggers began sharing what little facts where available. “News I didn’t expect to read this morning: A huge explosion damaged government buildings in central Oslo on Friday including Prime Minister Jens Stoltenberg’s,” wrote a blogger at epicmind. As reports soon began surfacing about the subsequent shootings, it became clear the two events were linked. And many blogs, especially those connected with news-gathering organizations, became a source for information even as the details were coming in slowly. In the following days, a number of blogs reprinted stories from wire services about the suspect, and how he was going to be dealt with in court. A number of sites, for example, posted the text from a July 25 Reuters story about Breivik telling a Norwegian judge that two more cells existed in his organization. While there was little new reporting having to do with the attacks themselves on blogs, social media was still a place where users went to convey or receive current information. Almost immediately after the initial news spread, discussion online turned to motives and speculation about who was responsible. Many bloggers, along with some members of the traditional press, proposed it was an international plot by Muslim extremists. However, after Breivik was identified and captured, details about his history-including the text of a 1,500 page manifesto he emailed to about 1,000 people-turned the conversation to his connection to conservative politics. Many bloggers connected Breivik with right-wing political groups throughout Europe. Some bloggers drew parallels between Breivik’s views and those of American conservatives. “There’s no doubt whatsoever that Anders Behring Breivik was seriously influenced by these people [conservative bloggers], and they know it. Their guilty consciences are showing,” concluded Charles Johnson at Little Green Footballs. While not as prevalent, there were some who claimed that Breivik was not actually a conservative or a true Christian. Instead, they insisted, he followed some other ideology. “Mr. Breivik…is being called everything from a Christian to a war gamer to a neo-nazi to a right wing fanatic. No one is calling him a socialist, but that’s the society in which he grew up. Why deny the biggest influence in his life?” asked Norma at Collecting My Thoughts. Thoughts and prayers for those harmed by the attacks were widely articulated, especially as bloggers first learned about the tragedy. “Our thoughts go out to the people of Norway and to the families of those killed. There are no words that can take away the hurt but just know that others in other countries are with you,” wrote Don at Canon Fire. Condemnation of assumptions in the mainstream press and social media that the attack was the work of Muslim terrorists was another key part of the conversation. On blogs, the criticism of the premature speculation was slightly more present than the actual Islam-connection. About 9% of the blogosphere conversation consisted of this charge against the media compared to 7% that made the connection. James Fallows at the Atlantic received a lot of attention for his critique of Jennifer Rubin’s initial response. “This is a sobering reminder for those who think it’s too tedious to reserve judgment about horrifying events rather than instantly turning them into talking points for pre-conceived views,” Fallows wrote. Others thought that members of the conservative press had ulterior motives. “It’s interesting that almost everybody has stopped calling this a terror attack all of a sudden and media coverage has dropped off considerably. If Anders had turned out to be Muslim, wouldn’t we still be calling it terrorism?” asked Taylor Marsh. A few bloggers who made an early connection with Islamic terrorism subsequently defended their posts. This special edition of the NMI adds software technology from Crimson Hexagon to PEJ’s ongoing tracking of most linked-to news stories in social media. Using this software, the Project can examine a much larger mix of social media conversation. To see the results of PEJ’s normal NMI methodology for the week of July 18-22, click here. The time frame for the analysis is July 22-27, 2011, which is different than the normal NMI week, Monday through Friday.